Morgan and Rahul chose the spectacular backdrop of the Ourika Valley as the backdrop of their wedding celebrations in Morocco. Guests gathered amidst the vegetable gardens under pretty parasols for mint tea before the ceremony. 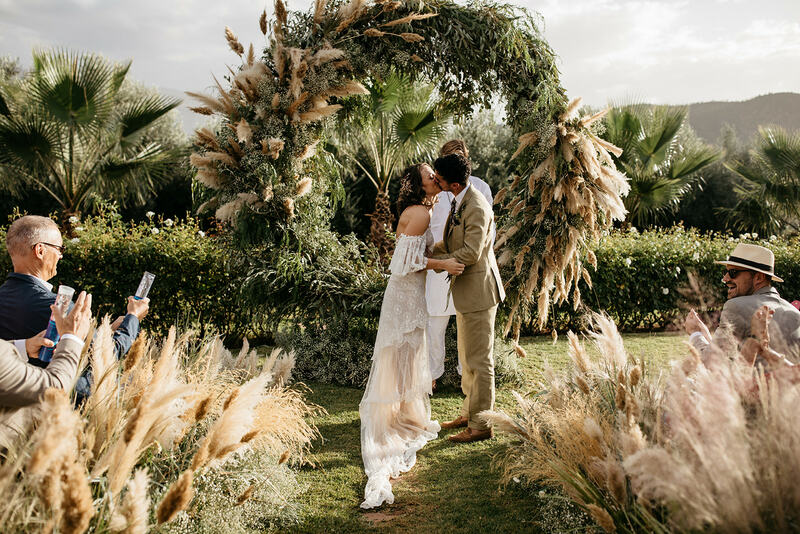 The couple exchanged vows under a pampas grass arch surrounded by friends and family on rustic raffia benches in keeping with the countryside setting. The reception tables were dressed with colourful bouquets in pink, orange and yellow tones, with Yves Saint Laurent Majorelle blue as an accent colour in the place setting. Small wicker tagines were filled with tiny bottles of rose water for guests to refresh their hands at dinner, and hundreds of lanterns and palm tree candle holders lit the open air dining room. The wedding party continued the evening with a dj and dancefloor in the middle of the gardens, under a star filled sky surrounded by walls of candles. Guests recovered with a pool party BBQ brunch complete with an African band and sunhat wedding favours.